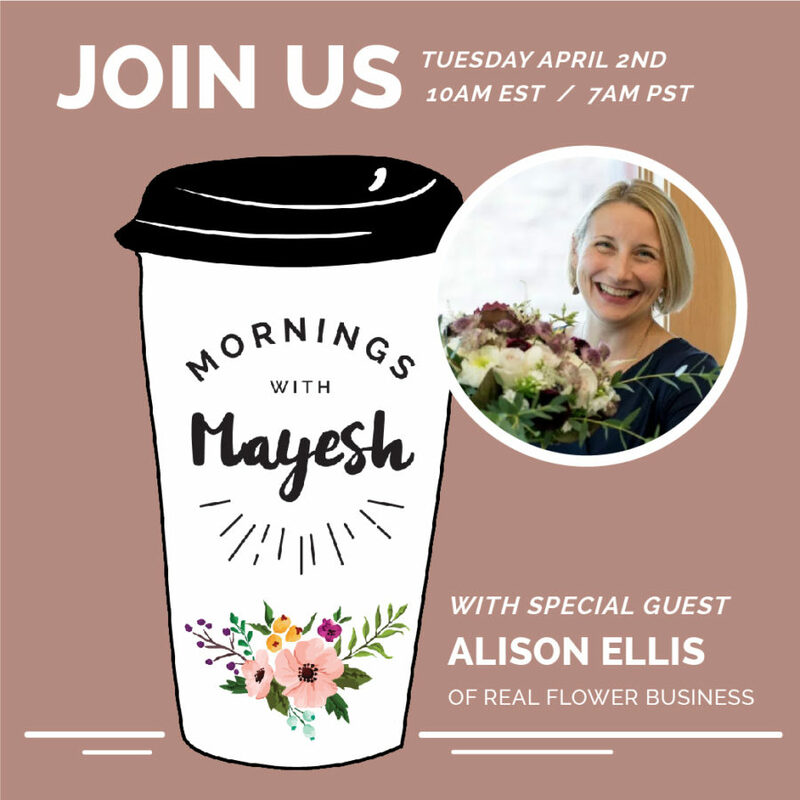 “Alison Ellis is a floral designer & educator that teaches florists how to embrace the business side of the business so they can make more money and take control of their future. She’s been working in the floral industry for 24 years; after spending 8 years training in half a dozen flowers shops, she opened a home-based floral business in 2002, which focuses almost exclusively on weddings. Alison’s business tips & teachings can be found at realflowerbusiness.com, which is listed in the top 40 of the “Best Flower Blogs on the Planet”. She’s been featured on FlirtyFleurs.com and is currently a regular business contributor to Florists’ Review Magazine. She has a wealth of knowledge to share with you and I’m so happy to have her on today’s show! Questions from Arbella: I know you got started with several restaurant accounts. How did that work? Did you have 2 sets of bud vases that you would just switch out? Or did you design on site during times the restaurant wasn’t open? And do you have any tips on how you built those relationships? Question from Carie: Lately I have had more brides wanting me to do a mock-up of their wedding flowers so they will be able to see what they will look like prior to the wedding. When I tell them that I charge for this service they are appalled and decide against it. I haven’t lost any clients over this yet, but wondered how other florists handle these type of people and are there florists out there that do this for free?? Why should florists set a minimum? If they’re just starting out, should you start with a minimum? How do you determine what you minimum should be? When should you raise your minimum? So that’s a sampling of what you’ll hear if you click to listen to the replay of the broadcast. Thanks for taking the time to check it out and listen! Remember you can submit a pricing question (or any question!) for my next guest appearance by CLICKING HERE. I’ll answer as many questions as I can in the broadcast! Hope to see you LIVE on April 2nd at 10am Eastern on the Mayesh Wholesale Facebook Page for our chat (click here to find Mayesh’s FB page!). And you can click to join my free Facebook group community for florist of all levels HERE. Have you seen my live chat, “How Much Does A Florist Make?” Click here to check it out! And don’t miss my most shared post to date: 10 Things I Did To Grow My Floral Biz... Click here to read it. Like this post? Subscribe to get every post, plus freebies like the one below, sent right to your inbox!